Want to be notified of new releases in statico/cadubi? This Perl program was written sometime around 1997 -- many years before I knew anything about Perl or Unix -- and the code hasn't changed much since then. It has, however, become very widely adopted and is available as a package on most Linux distributions. 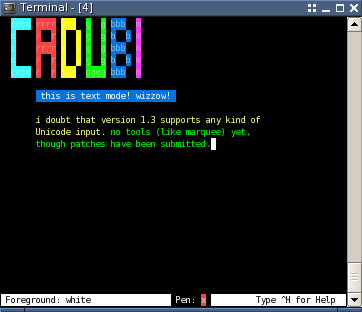 CADUBI is an application written in Perl that allows you to draw text-based images that are viewable on typical unix-based consoles. Usually the applications that emulate these consoles support various text modes, such as background and foreground colors, bold, and inverse. This text art, commonly called "ASCII art," is used in various places such as online BBSes, email and login prompts. CADUBI has a 'pen' which describes the current mode. Properties of the pen are the painting character, foreground color, background color, bold, inverse, and blink. Whenever you paint or use the text mode, the characters drawn on the screen will have the properties of the pen. The current mode of the pen is shown at the bottom of the console and is what will be drawn on screen when you paint. Move around the cursor with the i, j, k and l keys. Holding down shift and typing these keys will move the cursor five spaces instead of one. Pressing return/enter will move the cursor down one line and all the way to the left of the console. To paint the current pen on the screen, press the space bar. To delete a character, press the delete/backspace key. You'll notice that editing is much like common text editors, such as pico or joe. You can also delete with the tilde key, which makes moving & painting (right hand) and erasing (left hand) much easier. The pen character is the character that is drawn when you paint using the space bar. To change the character, press p and then the character you would like it to be. If you can't remember the codes above, you can always hit Ctrl-h to view the Quick Help which will display a summary of all the keys, color codes and examples of how they look. Typically, foreground text colors are the same as background colors, unless the text is bold. If the text is bold, foreground colors are usually lighter than the background color, making text easier to read when the text has the same foreground and background color. Refer to the Quick Help (Ctrl-h) to see what the colors look like on your console. Bold and inverse are two widely-supported modes. Bold is toggled with the g key, and inverse is toggled with the v key. Blink, though regarded as highly annoying, can be toggled with by pressing Shift-w. Text mode is an extremely useful feature. 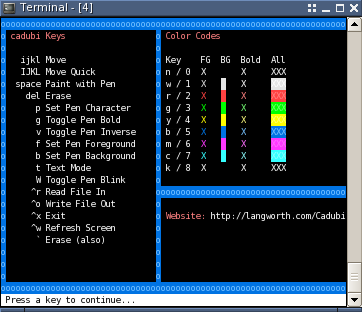 Once in the text mode you can type as if you were using a normal text editor, and all the characters drawn onscreen will use the same mode as the pen. To enter text mode, press the t key. To exit, press escape. To exit the CADUBI application, press Ctrl-x. Quick help can be accessed by pressing Ctrl-h. In case it is needed, pressing Ctrl-w will refresh the entire screen by redrawing each character. To read a file and use it with CADUBI, type Ctrl-r. To write a file, type Ctrl-o. You will be prompted for a filename. When CADUBI reads a file, it will only read as much that will fit in the workspace (the area of the console minus the bottom row [status bar]). To gain more workspace, see the -s operator in 'COMMAND LINE USAGE' below. CADUBI optimizes its output files to display properly and take up as little space as possible. 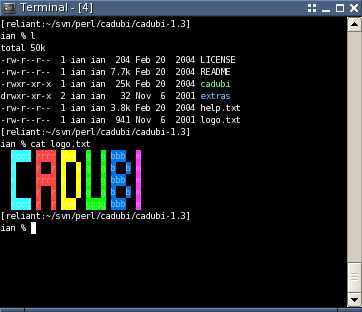 All CADUBI output can be viewed with the 'cat' utility. Whenever you are prompted to type in information, such as the name of a file to read/write to, you can hit escape to cancel. You can also hit escape to get out of text mode. When using the -s or --size command line option, make sure your console actually is that size or the text won't wrap properly and CADUBI will look funny.